4. Whether the branch is RTGS enabled. If yes, what is the IFSC code? I hereby declare that the particulars given are correct and complete. If the transaction is delayed, or not effected at all for reasons of incomplete or incorrect information, I would not hold the user institution responsible. I have the read option invitation letter and agree to discharge responsibility expected of me as a participant under the Scheme. Certified that the particulars furnished above are correct as per records. 1. Please attach a photocopy of cheque along with the verification obtained from the Bank. 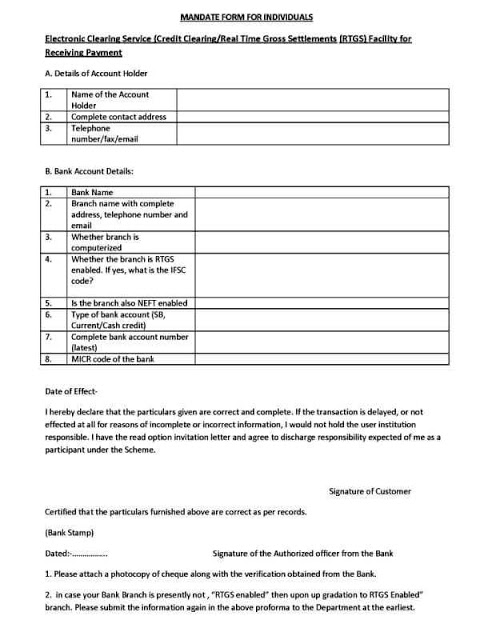 2. in case your Bank Branch is presently not , “RTGS enabled” then upon up gradation to RTGS Enabled” branch. Please submit the information again in the above proforma to the Department at the earliest.